… LINX, the London Internet Exchange, doesn’t work that way, so I’d no previous inkling when they recently gave me their 2007 award for a “conspicuous contribution”. 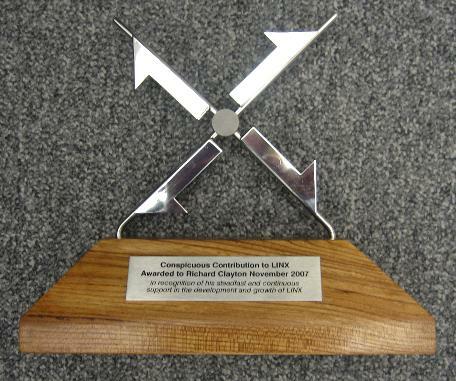 This award was first given in 2006 to Nigel Titley, who was a LINX council member from its 1994 formation through to 2006, and his contribution is crystal clear to all. My own was perhaps a little less obvious. I have regularly attended LINX general meetings from 1998 onwards — even after I became an academic, because attending LINX meetings is one of the ways that I continue to consult for THUS plc (aka Demon Internet), my previous employer. I’ve often given talks at meetings, or just asked awkward questions of the LINX board from the floor. But I suspect that the main reason that I got the award is because of my contribution to many of LINX’s Best Current Practice (BCP) documents, on everything from traceability to spam. These documents are hugely influential. They show the industry the best ways to do things — spreading knowledge to all of the companies, not keeping it within the largest and most competent. They show Government and the regulators that the industry is responsible and can explain why it works the way it does. They educate end-users to the best way of doing things and — when there’s a dispute with an abuse@ team — that other ISPs will take the same dim view of their spamming as their current provider (which reduces churn and helps everyone to work things out sensibly). Of course I haven’t worked on these documents in isolation — the whole point is that they’re a distillation of Best Practice from across the whole industry, and so there’s been dozens of people from dozens of companies attending meetings, contributing text, reading drafts, and then eventually voting for their adoption at formal LINX meetings. When you step back and think about it, it’s quite remarkable that so many companies from within a fiercely competitive industry are prepared, like THUS, to put their resources into co-operation in this way. I think it’s partly far-sightedness (a belief that self-regulation is much to be preferred to the imposition of standards from outside), and partly the inherent culture of the Internet, where you cannot stand alone but have to co-operate with other companies so that your customers can interwork. Anyway, when I was given the award, I should have pulled out a neat little speech along the above lines, and said thank you to the whole industry, and thank you to THUS, and thank you to colleagues and particularly thank you to Phil Male who had faith that my consultancy would be of ongoing value… but it was all a surprise and I stammered out something far less eloquent. I’m really pleased to try and fix that now. Nice comments, and well put! The strength of community spirit is one of the things that marks LINX out within the Internet exchange community, and I believe it is a major factor in our continuing success.